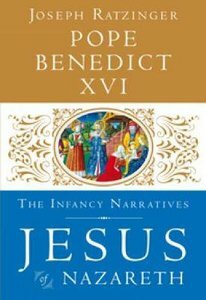 The momentous third and final volume in the Pope's international bestselling Jesus of Nazareth trilogy, detailing how the stories of Jesus' infancy and childhood are as relevant today as they were two thousand years ago. In 2007, Joseph Ratzinger published his first book as Pope Benedict XVI in order to 'make known the figure and message of Jesus'. Now the Pope focuses exclusively on the Gospel accounts of Jesus' life as a child. The root of these stories is the experience of hope found in the birth of Jesus and the affirmation of surrender and service embodied in his parents, Joseph and Mary. This is a story of longing and seeking, as demonstrated by the Magi searching for the redemption offered by the birth of a new king. It is a story of sacrifice and trusting completely in the wisdom of God as seen in the faith of Simeon, the just and the devout man of Jerusalem, when he is in the presence of the Christ child. Ultimately, Jesus' life and message is a story for today, one that speaks to the restlessness of the human heart searching for the sole truth which alone leads to profound joy and freedom. This ostensibly simple message is also the most profound challenge to the individual human being at a time of unprecedented turbulence and change. There is no greater vocation for a Pope than to preach the Gospel and this is what in this book Pope Benedict has done with conviction and urgency. This new book is a masterpiece of its kind. About "Jesus of Nazareth (#03 in The Infancy Narratives Series)"